You must state at contestant registration whether or not you are providing your own rigging/horse. If you are not, the rider and owner must sign a shared rigging/horse form showing the owner of the rigging/horse to be shared so that secretarial can make any necessary changes in the running order. Rough stock rigging: may only be used twice per event, per gender. Please state on the form for preference of who goes first. Speed event horse: Horse may only be used twice per event, per gender. Please state on the form for preference of who goes first. The 2019 Best Buck in the Bay Rodeo and Festival is an IGRA sanctioned event and is subject to 2019 IGRA rodeo rules. Contestants must be a member of an IGRA Association and of legal age (18). You can sign up as a new member or renew your GSGRA membership @ http://www.gsgra.org/MbrShip/GSGRA_MbrShip_Intro.htm. We request you select Bay Area Chapter as your preferred association. ​Entry fee is $30.00 USD per person/per day/per event. Contestants must enter a minimum of either one (1) event each day or two (2) events if only competing on one day. Registration form must be accompanied by a non-refundable entry fee deposit of $60.00 to avoid late fees. Contestants with an assigned IGRA number must mail a completed IGRA Event Entry form with a postmark date on or before August 25, 2019. Complete an online registration form with a date/time stamp no later than September 1, 2019. A $50.00 USD late charge will be assessed for late registration entering or adding rough stock or roping events at registration (per IGRA rules). Congratulations on competing in the 2019 Best Buck in the Bay Rodeo & Festival! New Contestants not having an IGRA contestant number do not need to pre-register, they may register and become a member of an IGRA Association Friday night at registration. A GSGRA membership will be available at registration. New contestants will receive an IGRA Rodeo Rulebook at registration. You can also download it from and click on Rodeo Rulebook. Contestants must be familiar with the rules pertaining to their events. 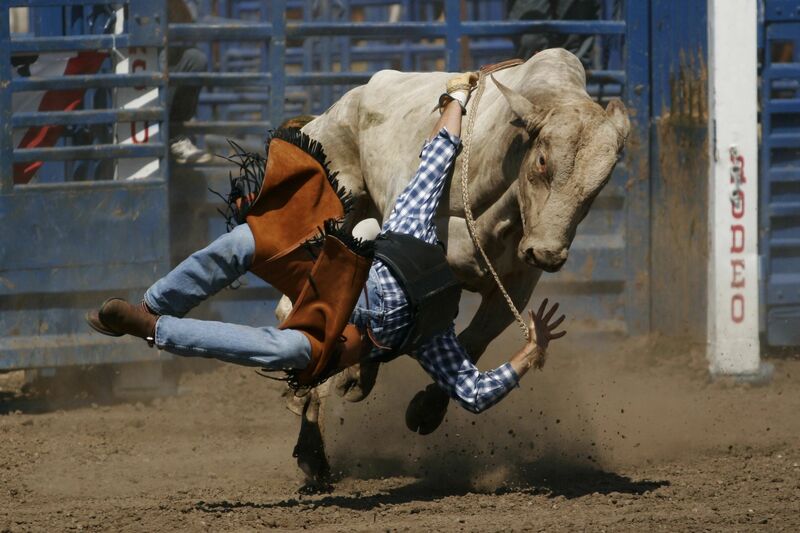 A minimum registration fee of $60.00 USD is required to compete in the rodeo. Each event is $30.00 USD per event per day. All entry fees paid during registration must be paid in cash, certified Check (no personal checks), or money order. New Contestants MUST attend the “New Contestant Meeting” on Saturday in the small stands near the announcer booth. Time to be posted at registration. Failure to attend this meeting will result in disqualification. Please arrive on time…roll call will be conducted at this meeting. All contestants are required to wear long sleeve shirts, long pants, western hat and western type boots that minimally cover the ankle and have a heel. Hats must be worn on the contestant’s head when entering the arena. No rolled or pushed up sleeves will be allowed except on the riding arm and only during rough stock events. The penalty for infractions are posted in the IGRA Rodeo Rules for 2018. This dress code does not apply to any camp events; however closed toed shoes must be worn. Each contestant will be issued a contestant number that must be worn on the contestant’s back at all times during their specific events. Only a contestant may scratch himself/herself from any or all events. No alcohol or recreational drugs may be consumed while competing or while wearing contestant number. Contestants may not compete if under the influence of drugs or alcohol. Pets are allowed, but must be on a leash. Bill Parmeter Fields requires living quarter horse trailers must be parked in a designated camping site. BBITB will provide at no charge (one) horse stall per contestant pre-registered in any horse event and no tack stalls will be available. Registration can be made online with the IGRA Registration form. Contestants may reserve additional stalls at a rate of $25 USD. The fee will not be refunded. For late registrants, stalls are not guaranteed, but may be available at a rate of $50 USD. All stalls will be available on a first come first served basis, with a limited number available. Check in time is 12 noon Thursday and departure is 12 noon Monday. No shower facilities are provided, no dumping of gray water, and no power is provided. Our on site Vet will be provided at a later date. A list of Farriers will be provided in the contestant bags. The 2019 BBITB is a non-smoking rodeo during the rodeo events in the arena and secured working areas. This includes in the Arena, behind the chutes, in the barn, and/or the outside stalls. Penalties will apply for non-compliance. A Zero tolerance level will be in effect. Buddy passes are only available for purchase at registration, Friday evening between 6:00 pm – 9:00 pm. Passes can be purchased by any contestant registered. The cost is $50.00.